Welcome to the grand final of Robot Wars for 2017 and my god was that a phenomenal episode as we saw fight after fight of epic proportions. The episode started off with a statement of intent with the 10 way free for all that saw a hodgepodge of robots go at each other such as former winners Apollo and upstarts Concussion but in the end it was the skilled Eruption that earnt another shot at glory and did they take it. More on that later. The group battles also saw some greatness with joke robot Nuts 2 doing the unthinkable and defeating not only Behemoth with a sneaky minibot but taking out Carbide’s main weapon with its flail before winning the heat. This was the Robot Wars unthinkable yet it was happening. The other group battle, while less David vs Goliath, saw the start of Magnetar’s revelation that maybe Pulsar’s problem was the machine but rather its creator. 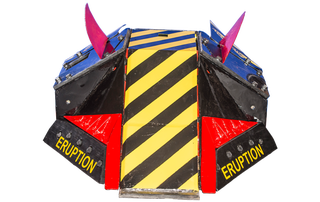 Magnetar was winning vs Eruption after Rapid was knocked out but felt the need to get cocky and was defeated by Eruption’s flipper. In the following battle against Behemoth it did the same thing again, with Behemoth out for the count he decided for one last attack only to be flipped upside and immobilised. Once again Pulsar/Magnetar ended up in a grand final only to waste their slot by making rookie mistakes. In its redemption round Carbide predictably made quick work of Rapid as it sent the machine up in flames from repeated attacks before getting revenge on Nuts 2 in the semis, with a makeshift chainguard preventing Nuts from dislocating it once again, while Behemoth was soundly defeated by Eruption if spared the humiliation of a flipping out the ring. This led to yet another Eruption vs Carbide showdown and it looked set to be the usual affair with Carbide slowly tearing Eruption to pieces. Here however Carbide’s plan buckled as despite tearing chunks out of Eruption the flipper just kept going until Carbide’s power ebbed away and began running for the hills. In the end the fight was a pulse-racing three minutes that saw Eruption finally win the crown it deserved and Carbide seeing their wings clipped somewhat. Great final to a series that has had a few bumps but well worth the price clearly.